Consolidate the invoice, day, month, year and time into one variable. Convert the CUSTOMERID variable from character to numeric. The code above restructures the France data set into the france_sales_201110_clean daa set. It consolidates the invoice information into one variable. It also converts the CUSTOMERID variable into a numeric variable using the INPUT function. Let's run a CONTENTS procedure on the newly created france_sales_201110_clean daa set. There are only eight variables in the data set, which is good. There is only one INVOICEDATE variable containing the invoice information. ​The CUSTOMERID variable is a character variable. Let's compare the online_retail data set with the france_sales_201110_clean again using the COMPARE procedure. 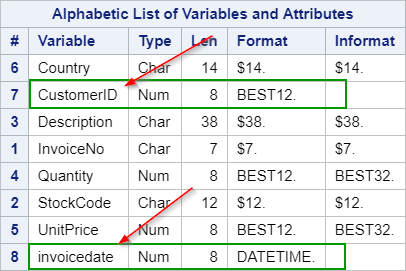 Both of the data sets have eight variables. The differing attributes could be a problem. It turns out that the two variables are differing in the INFORMAT attribute. This will not affect the data values or any analysis results and it can be ignored. Now that the two data sets contain the same data structure, we can aggregates the ​france_sales_201110_clean data set into the online_retail data set. The online_retail_new data set is created. It combines the original online_retail data set with the france_sales_201110_clean data set.